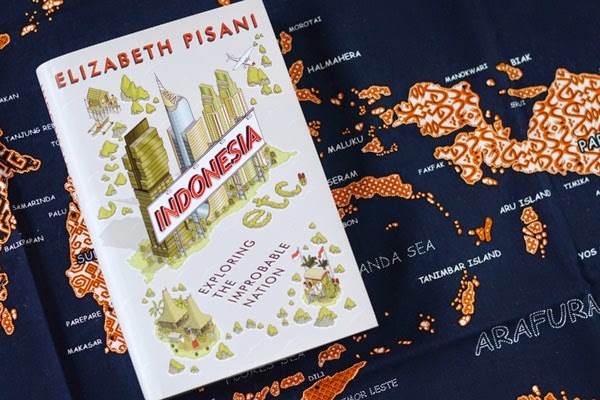 An instance with Elizabeth Pisani, author of Indonesia Etc. published - yesterday! Congratulations Elizabeth! We were deep in Borneo, on the cusp of Lake Sentarum. Hornbills overhead. Kingfishers in riverbank shadows. Our thin canoe cut crisply up the jungle river. We didn't have much: a small bag each. Author Elizabeth Pisani had an old brown helmet with a strip of blue batik around it and a handful of notebooks; I had a couple of Nikons. One of Elizabeth's worn black shoes was tied to her ankle with a purple ribbon. 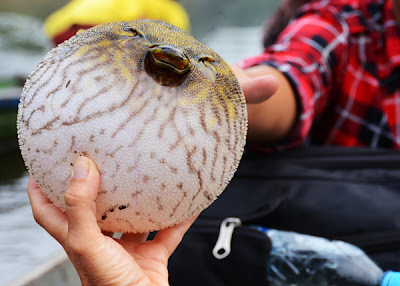 Someone put a live, wet pufferfish on my rucksack. We docked at Nanga Lauk, a hamlet halved by the river and joined by a long, high cable bridge. The riverbanks were steep and sheer and ascended by gangplanks. 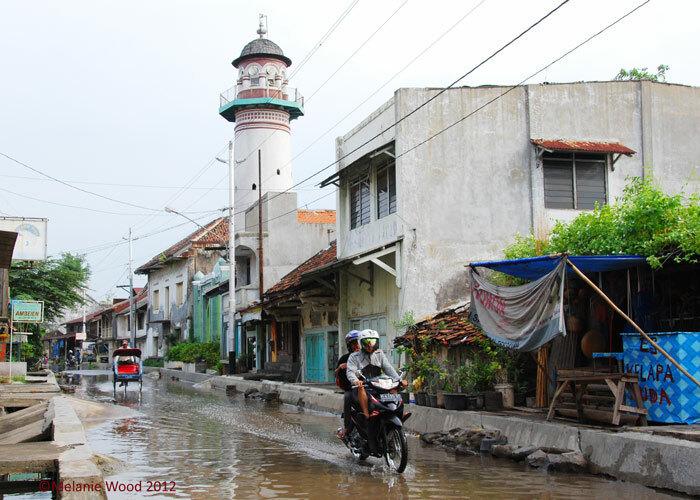 The entire village was built on stilts, with paths on long, spindly legs linking the wooden houses, mosque, and school. 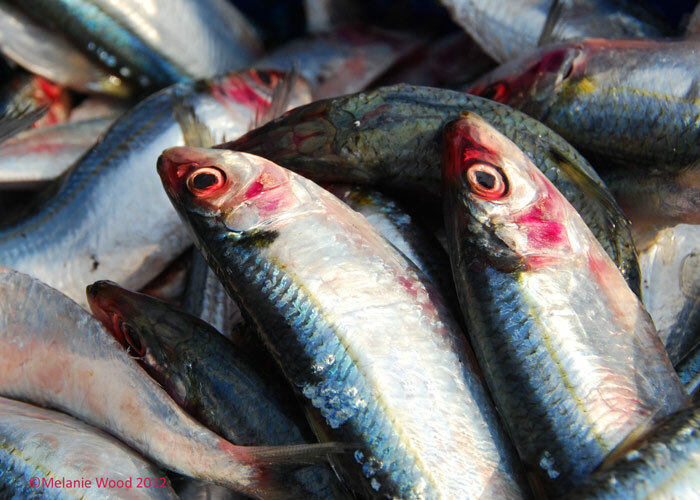 Splayed, salted fish sundried along the raised walkways. Soft-bellied women in teddy-bear pajamas squatted on the walkways eating fried banana dumplings. Followed by children, Elizabeth and I walked across the bridge. It bounced and whined. The river was a long way below. 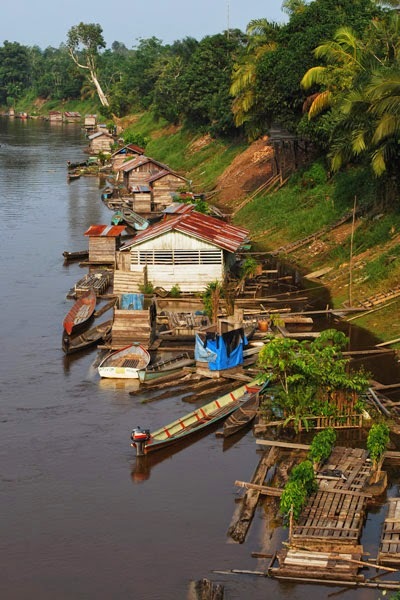 Way down in the brown water floated wooden platforms holding gardens, bathrooms, and submerged fish cultivation traps. “I’m going to jump in,” Elizabeth stated. And I cowardly retreated and knelt on the riverbank, watching her through my lens and wondering how deep the water was. Elizabeth was barefoot and dressed in black. She looked tiny up there. She climbed over the cable and casually stepped off the bridge with a chirrup of thrill. Down she dropped. Click. Click. Click. 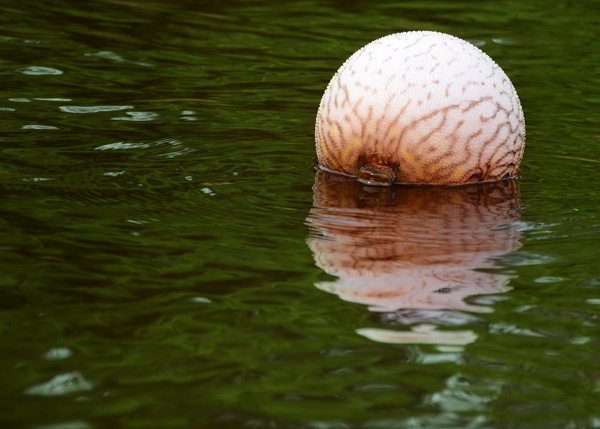 She fell 40 feet into the water, and came up swimming hard against the current, hauling herself up and onto one of the floating platforms, where a man in yellow underpants was washing his bottom. This confident, easy, casualness was typical of how Elizabeth traveled. When I first met her she’d been on the road for 10 months and was researching her new book. 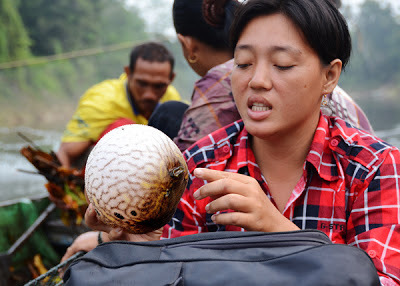 She was after a will-o’-the-wisp: the benang merah or red thread that binds the disparate cultures of Indonesia together. 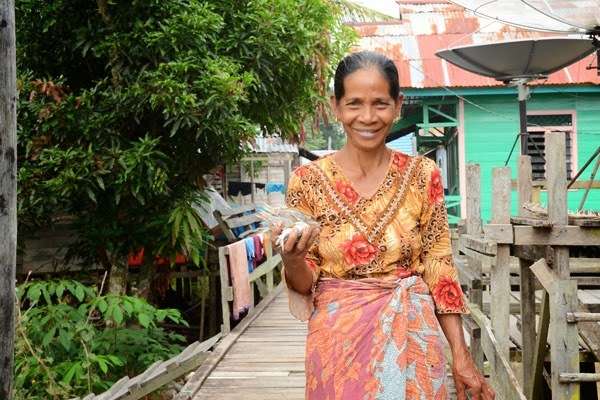 Elizabeth traveled 13,000 miles by bus, boat, and motorbike - exploring 26 of Indonesia’s 33 provinces. Then she hunkered down in a garden in Bangkok and, peeling and eating hundreds of quail eggs, wrote Indonesia Etc. Exploring the Improbable Nation, published by Granta Books this June. The timing is deliberate: a shade before Indonesia’s presidential elections in July. Indonesia Etc. will be in bookshops this June with a translation in bahasa Indonesia following. For those of us in Indonesia, this is the book of year. 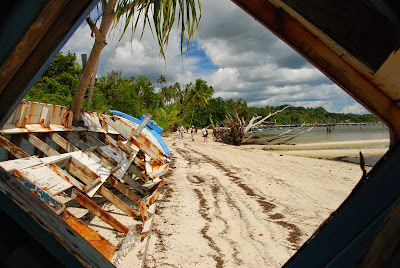 On an island off the coast of Belitung is an old wrecked ship. I climbed inside. And then with this shot won a Tamron camera lens in a photography competition in Australia's Get Lost magazine! Happy day! It's hard to find Get Lost in Indonesia, but Kinokuniya bookshops in Singapore carry it. It's well worth picking up. 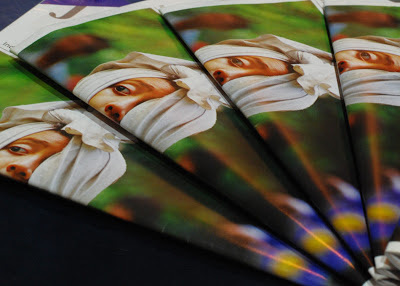 Their photography is bold, the graphic design eye-catching, and the front covers striking. But best of all, the articles are actually about travel: having adventures, not lolling in resorts. 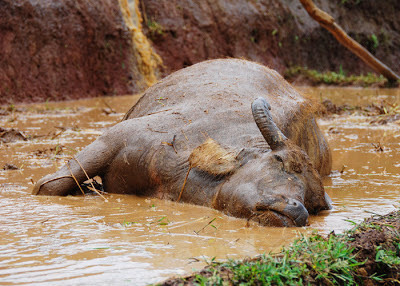 Gangs of Indonesia is taking a long mud bath... But will be back with more stories in November. Hot off the press! 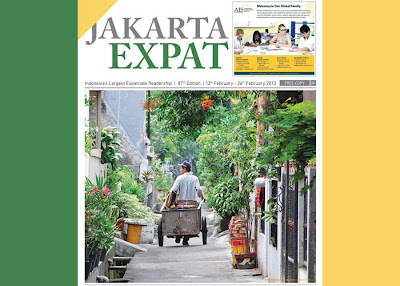 Gangs of Indonesia's original gang photograph takes the front cover of the new issue of Jakarta Expat. Hearing a whoop, doors open and a chorus of women in baggy dresses bustle from their homes into the lane. It's a narrow leafy lane with drainage ditches, black and stagnant, on either side. Simple planks cross the open drains; some are bridges to the houses beyond, others hold plants and flowers growing in old paint cans. It's early: the bite of the sun has yet to come. The whoop is the call of a vegetable vendor, pushing his wares in a wheeled cart. 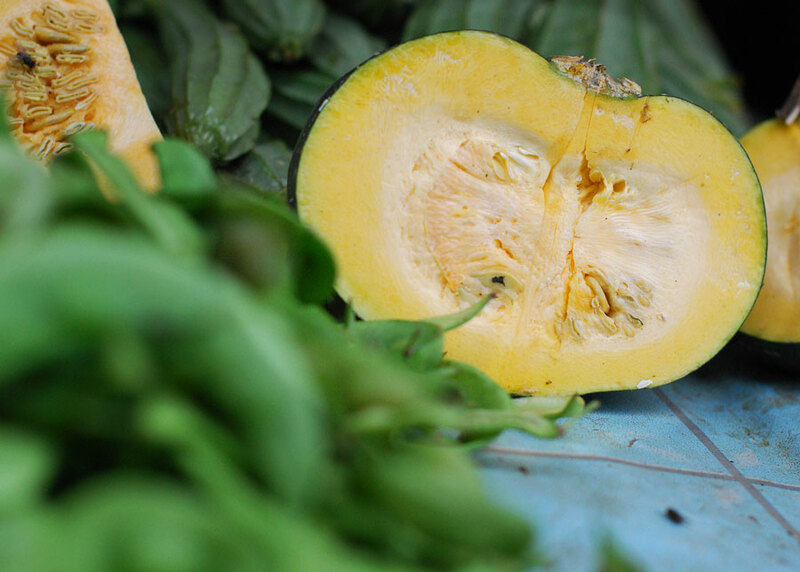 He kicks down the stand of the wooden cart and the women prod the market vegetables. One eye on the produce and an ear for the daily gossip. This mobile market is a fresh salad of bean sprouts, leafy greens, tomatoes, peppercorns, oncom (fermented soy beans), prawn crackers, boxed coconut milk, and dried noodles. Draping the side of the cart like shiny grey fish scales are layers and layers of transparent plastic bags. A young mother spoons puree into the pout of her eight-month-old daughter. She sighs. "It's difficult to make her eat." The baby's bare thighs are splattered with sauce. Then a dappled cat trots past. "Puss," coos the mother. "Meow. Where's he going?" But the baby remains tight-lipped and the gruel trickles down her chin. "Have you got chicken liver?" a woman asks. The vegetable vendor opens a door within the body of the cart. In the gloom a single yellow chicken foot claws upwards from a hillock of bagged entrails. "I've got chicken, beef, and prawns," he lists. The women berate him for his prices and the haggling begins. Mohammad Ariefin knots weighted grey beads into a nylon fishing net in the gloom of his wooden house. One foot, long infected, is caked in a sulphurous crust. "Come in! Don't be shy," he chirps, one eyelid drooping. "It's shoddy in here, but do sit down." Ariefin, 85 years old, runs a fishing tackle shop on Jl. Layur in Semarang's decrepit old town. Today the lane is flooded rat-brown. 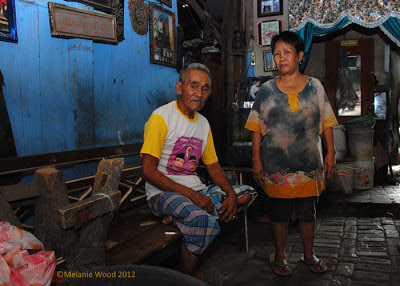 "It always floods after rainfall," sighs Ariefin's wife Derma. "The drains are blocked with garbage and corruption." Behind the dirty laundry of an old advertising banner, the shop porch is busy with reels and rods, beads and buoys, hooks and hats. And a stall offering iced coconut juice. 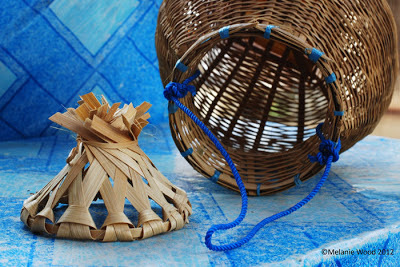 Woven bamboo caskets hang from thin blue rope by the old blue door. "They're called kepis," says Ariefin. "Fish cages." The cages have tapered necks and removable stoppers. "It's not nice, but come inside," repeats Ariefin. "I already said don't be shy." "In essence, all people are the same," he replies. He is wearing an election t-shirt bearing the slogan Not promises but proof. Inside, amid the shadows, wispy white nets trail greasily from the ceiling like jilted veils. "Me?" Ariefin exclaims, sucking on a clove cigarette. "Not at all." Steaming in a bucket of dye are black nets. "For birds. I do like catching birds. 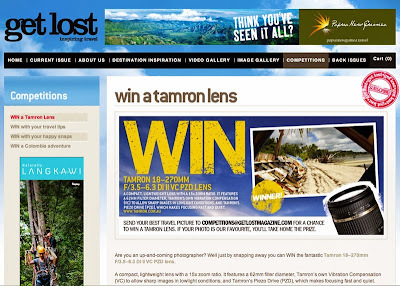 Good for racing and singing competitions." "His foot is sick," says Derma, as Ariefin leaves the room. "He got a splinter in it from that cupboard there. We got some expensive medicine (Rp 50,000) from the doctor, but now the medicine's gone and the infection hasn't." Ariefin's bare foot is the texture and colour of yellow powder paint muddied with supermarket sambal (chili sauce). He returns with an earthenware tile. 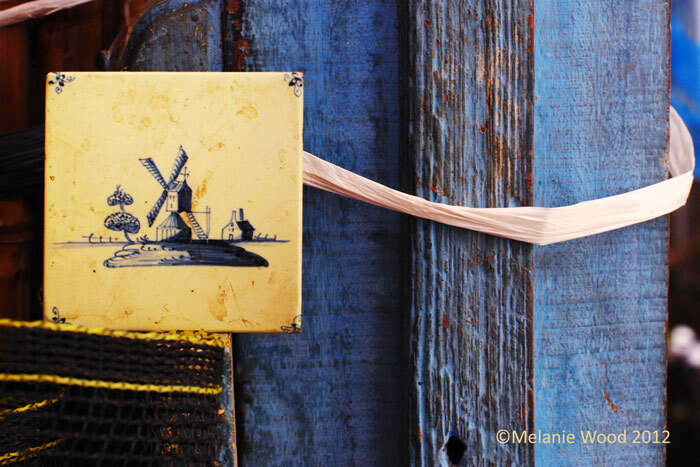 Against grubby cream is a Delft-blue windmill scene. "Win meal," Ariefin and Derma giggle. "A Dutch person gave this to us two years ago." Four days later I see similar tiles decorating the interior of the sultan's palace in Cirebon. At the top of the road is a metal stall selling recycled cups of rosy grit. Fishermen wearing motorcycle helmets and quivers of rods crowd the seller who tips a cup onto the counter. Pink worms squirm. 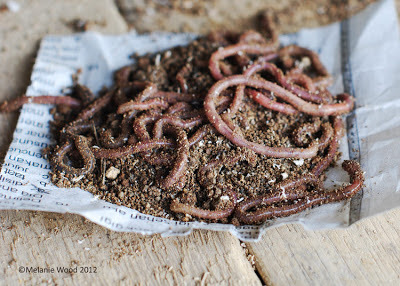 A pot of 12 worms costs Rp 2,000 ($0.20). "Do you have worms in England?" the seller asks. "Of course not!" one fisherman scoffs. 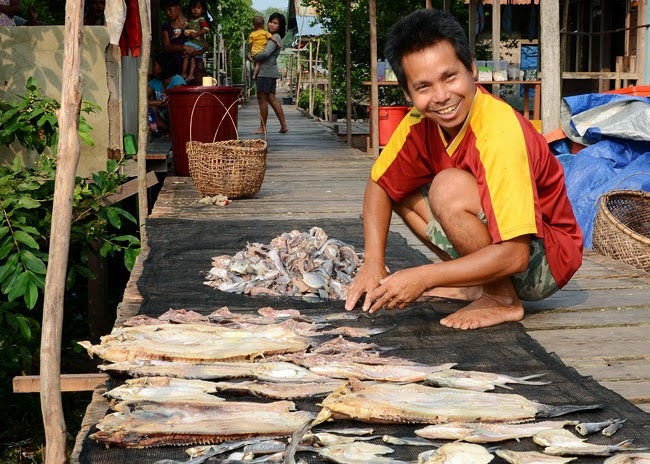 The fishermen laugh loudly. "Yes! Yes!" they chorus. "Of course there are worms in England! Many worms in England!" 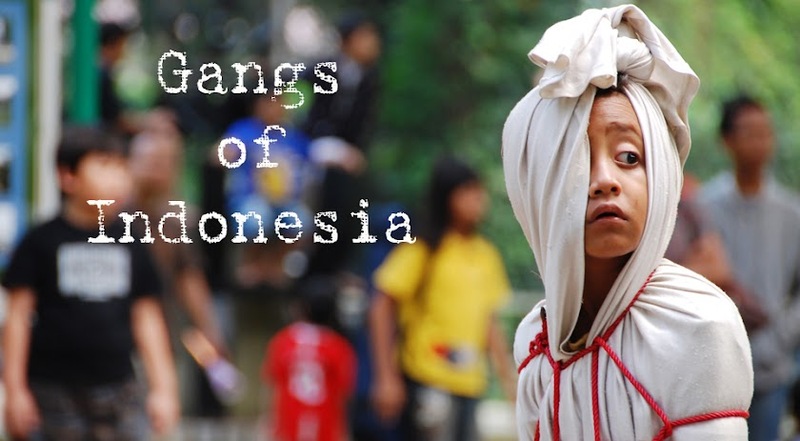 Gangs of Indonesia's pocong boy takes the front cover of the biweekly Jakarta Expat magazine. 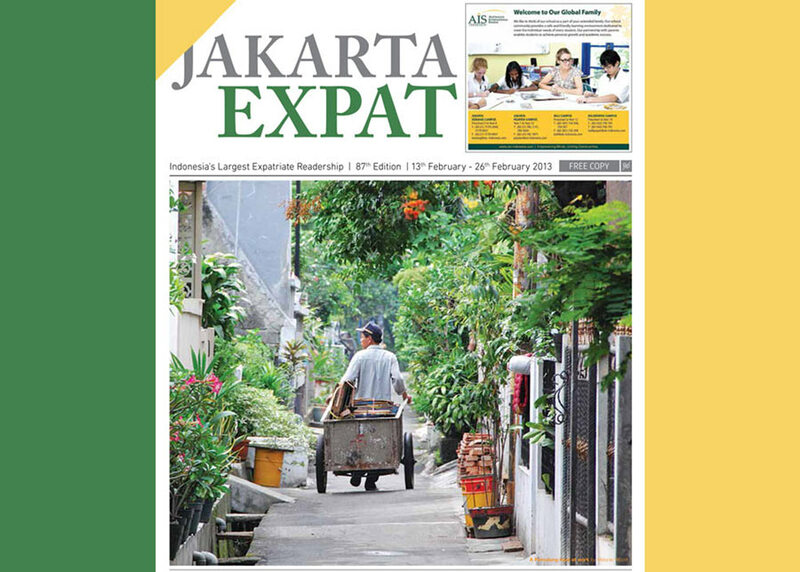 "Trail-blazing," says ace reporter Catriona Richards in today's The Jakarta Globe (read here). A quietly beaming post today. I like this definition of trailblazing from the New Oxford American Dictionary: "...new track through wild country."